HG FYI: Prices are accurate at time of publication and are subject to change. 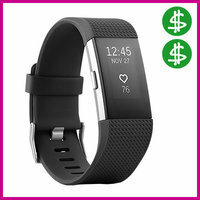 By now, you're familiar with fitness trackers like the Fitbit. Maybe you have one and are looking to upgrade, or maybe you're finally ready to invest for the first time. Either way, take a look at the Fitbit Charge 2: Its pulse-tracking technology can better measure your body's calorie burn, and it examines your sleep patterns! Track your all-day activity by steps taken, distance covered, floors climbed, and more… We love being in the know! We're all accustomed to the "why can't I find a matching container & lid?!" struggle. That struggle is very real, even here at Hungryland! 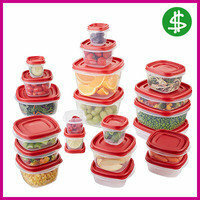 So treat yourself to this enormous set of containers safe for the microwave, freezer, and dishwasher. The lids can snap together and snap on to the container bases, so they're easier to keep track of. Perfect for make-ahead meals, leftovers, and more! 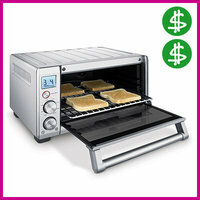 We love a good toaster oven: It heats up faster than your average full-sized oven, which means less wait time! Well, this snazzy toaster oven goes above and beyond. In addition to the usual qualities, it features special settings for baking, roasting, broiling, and more, plus high-tech engineering that ensures the heat is evenly distributed. WOWOWOW! One of the most frustrating things about measuring cups and spoons is when their labels rub off, leaving you wondering whether you're staring at a teaspoon or a half tablespoon. Not with this classy set. The markings are molded into the plastic. The cup sizes range from 1/8 to 2, and the spoons go all the way down to 1/32 of a teaspoon! Plus, they're super pretty. 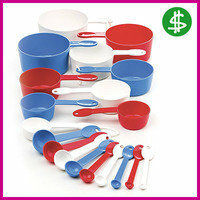 Scoop up a set; perfect for the avid cook or the absolute beginner! This schmancy home espresso maker is the bee's knees. 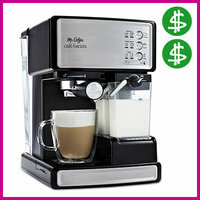 In addition to yummy espresso, it cranks out lattes and cappuccinos and features an automatic milk frother. Plus, there's a one-touch control panel, making it oh-so-easy to brew up your double shot in a jiffy. That milk frother makes even an ordinary cup o' joe feel special! Today, January 5th, is National Whipped Cream Day. Keep it light and all-natural with Skinny Truwhip and So Delicious Dairy Free CocoWhip! Light. Send this roundup to your significant other, and maybe they'll gift you with something on the list! Click "Send to a Friend" now.